Last night at the T-Mobile Arena in Las Vegas, the crowd witnessed what was clearly a fight of the year candidate when Saul Canelo Álvarez took on the undefeated Gennady Golovkin in a 12 round middleweight showdown for the ages. There is just one problem with the fight of the year and that is that it ended in one of the most controversial manners when the fight was declared a split draw. The fight was ruled a draw after judge Don Trella scored the bought 114-114, but the real mystery belongs to Adalaide Byrd who scored the fight 118-110 in favor of Álvarez who in the eyes of many did not win the fight. All of us were left wondering what boxing match did Byrd watch and how much was she paid to throw the monkey wrench in their. In all fairness to her, it was at times a difficult match to score depending on what you think wins a round. Clearly Álvarez did enough in her eyes to win that many rounds in the fight with his counter punching and body shots. The first three rounds did belong to Alvarez out right and the last two rounds of the fight could have been scored in either direction. However, you can not tell me that rounds four through ten did not belong to GGG. The man was a workhorse who should absolutely no fear as he punched and jabbed his way through Canelo’s power punching attack. After all of that, what does this mean for the sport of boxing and will they recover from this after they had been selling it as the fight of the year? Oscar De Lay Hoya, whose Golden Boy Promotions handled the fight, had been telling us for weeks that we were getting a real fight after the Mayweather/McGregor sideshow that we had seen weeks before. This was a fight that featured two of the best that the sport had to offer and this is the result that you give the fans, a draw? Teddy Atlas may have a had a point in saying that this is why people feel that the sport is corrupted and that judges are easily paid off at times or at least we are left to wonder that. If you are striving to make a point to make Boxing the popular sport over Mixed Martial Arts then this is not how you do it. This is exactly the reason why people tune in to the UFC and why their PPV buyouts have been insane over the last five or so years. Gone are the days of seeing so many top contenders in boxing like Sugar Ray Leonard, Roberto Duran, Hector Camacho, Thomas Hearns, Marvelous Marvin Hagler, Julio Cesar Chavez, Pernell Whitaker, Vinny Pazienza, Felix Trinidad, Fernando Vargas, and so many more. Those were the golden years at least for me anyways, but I am hoping that Boxing can recover from this and that we will continue to see amazing fights. The only question left now as well is are you going to be buying Canelo vs GGG part two? Check out the Adalaide Byrd’s scorecard below and I wanted to tell you that I scored the fight 116-112 in favor of GGG, you can also see that card below hers. Last night, one of the biggest fights in boxing took place last night in Las Vegas that more than likely overshadowed another big fight in California. Conor McGregor, the UFC Champion, stepped foot into the squared circle for the first time in his career professionally and he danced with the best of them in undefeated future hall of famer Floyd Mayweather at the T-Mobile Arena. It truly was the money fight with all of the hype that we had been hearing for three months, but there were a lot of questions asked before hand and they were certainly answered. One thing is for sure, you have to give Conor McGregor a lot of credit because he took a huge chance stepping foot in that ring, but he proved a lot of people wrong. Conor came right out of the gate and he looked impressive, but that was just Floyd allowing Conor to tire himself out because that is what a 50-0 fighter does and did. Floyd at first didn’t look like the aggressor, but as soon as those later rounds started coming, he turned it up and he was taking the fight to McGregor as he had promised he would. The question of the night though was whether Conor could go the distance and sadly he couldn’t as he was completely out of the fight by the ninth round. That is where Floyd did his damage and earned his $350 million dollar payout for the night and that is not including the gates I believe which broke PPV records. I just want to throw this into your head to let it sink in so you know why Conor deserves a lot of credit for stepping into Floyd’s world and to silence the naysayers. Conor McGregor according to ESPN, landed 30 more punches on Floyd in ten rounds then Manny Pacquiao did in a 12 round fight. Let that sink in as to whether you think this fight should count on Floyd’s record. Now, Floyd rides into the sunset with his record breaking 50-0 win/loss record and the future is uncertain for Conor as far as boxing is concerned, but you can bet he’s not going to be cheap anymore not even for the UFC. There were some decent matches on the undercard with my favorite being the Badou Jack/Nathan Cleverly fight which ended with an impressive TKO win for Jack in the fifth round. The most unimpressive fight of the night belongs to Gervonta Davis who beat Costa Rican sensation Francisco Fonseca in his US debut in very controversial fashion. At the end of the day, Conor just needs to learn how to use his power with his combos, he just needs to work on his stamina, and he could be a weapon of mass destruction in boxing. I am giving the fight an A- overall because it was entertaining and I didn’t feel gypped like I did with the Mayweather/Pacquiao fight. It was a night of boxing at The MGM Grand Arena in Las Vegas as Amir Khan took on Devon Alexander in a 12 round welterweight match. Before their fight, one of the welterweight divisions most exciting young prospects in Keith “One Time” Thurman took on a virtual unknown here in the states, but a crafty undefeated Italian Leonard Bundu. For Keith, it was his first fight in over 8 months as he had to take a break due to an injury to the shoulder, but the knock out king was ready for action. 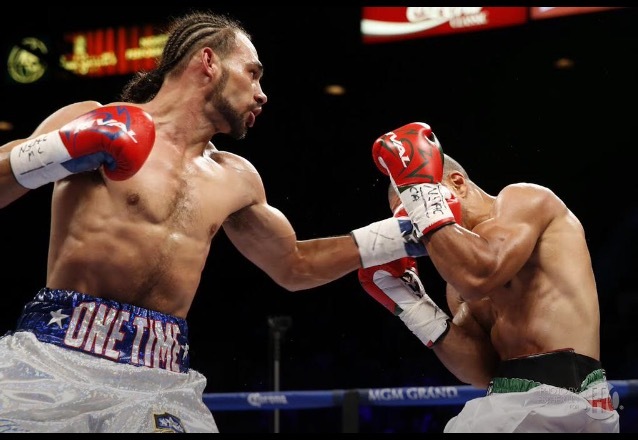 The fight was definitely not one the fans at the arena wanted, but stylistically Keith Thurman threw a boxing clinic. He managed to knock Leonard Bundu down within the first 50 seconds of round one, but after that the fight did get slow. Leonard Bundu was constantly changing his stance and he was barely throwing punches and Keith was picking his spots through out the fight. It wasn’t until round 10 that Bundu threw anything substantial at Thurman, but it was too late for Bundu. I had scored the fight 119-108 meaning that I gave Bundu one round and Thurman the other 11, but all three judges scored the fight 120-107 (12 rounds to 0) in favor of Keith “One Time” Thurman. After the fight, Thurman said he had a little trouble with Bundu’s constant shifting, but in the end he called out Marcos Maidana. For Amir “King” Khan, it was a chance to continue dominance in a new weight class as he was fighting only his second fight as a welterweight (defeating Julio Diaz in his first fight). For Devon Alexander, he was coming off a huge comeback win against Jesús Soto Karass, but he was facing a boxer that was going to frustrate his style in Amir Khan. Amir showed throughout the whole fight why he was 6-0 against southpaws as he frustrated Alexander with four/five punch combinations and he worked the jab beautifully against Alexander trough out the whole fight. Now, I’m not saying Alexander didn’t do anything, but Khan’s size proved to be a hefty task for Alexander to deal with throughout the whole fight. Khan in the fight landed 243 out of 563 punches thrown to Alexander’s 91 of 461 making Alexander look like an amateur. I gave all of the rounds to Amir Khan (120 to 108) while the three judges scored the fight 119-109, 118-110, and 120-108 in favor of the winner Amir Khan. Now it begs the question that if the Mayweather/Pacquiao fight does not happen, will Amir Khan be his next opponent or will Keith Thurman throw his name into the hat?